Whew. 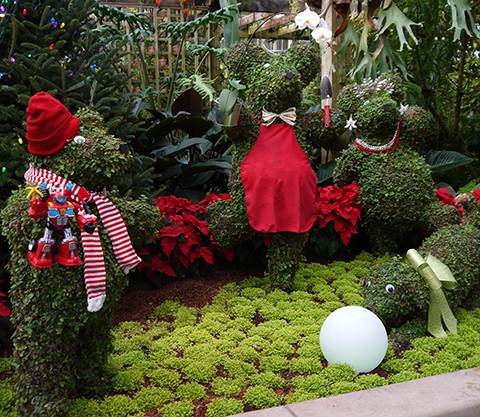 Our Garden Lights Holiday Nights display is finished! We threw open the doors Friday night and as visitors flowed through the Conservatory and Orchid Center we could see delight in so many faces. It was enormously gratifying and worth all of the hard work just to see those faces. 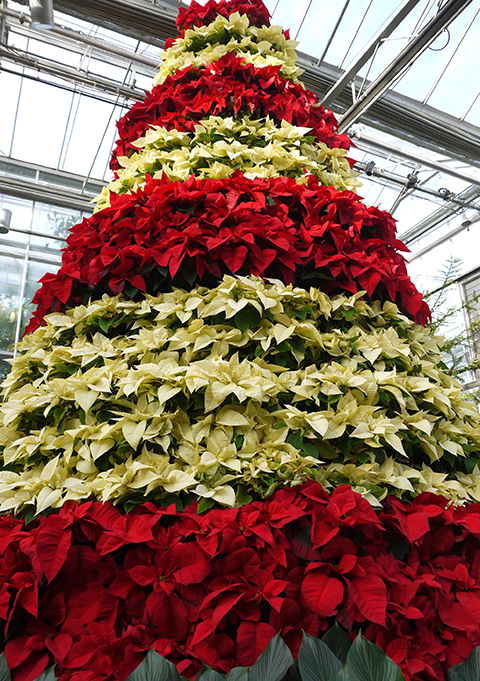 Q: How many Poinsettias does our gigantic Poinsettia Tree have? The Inside Scoop. Our eighteen foot tall tree has enough rings for 544 plants, but we have never used that many. We do a complete switch out of plants after four weeks, so a total of 1,000 Poinsettias will inhabit the tree during this holiday. The tree has an automatic irrigation system so that we don't have to hand water them all. 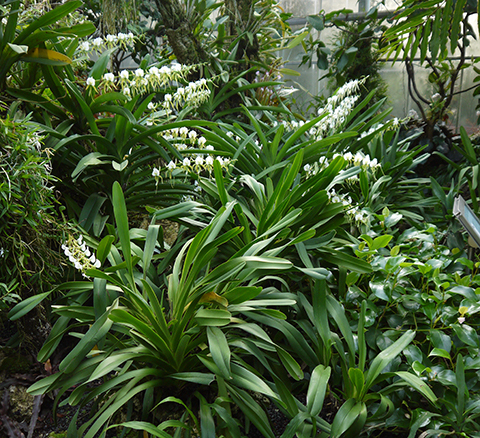 Q: What are the lovely lily-white flowers at the base of the tree? The Inside Scoop. 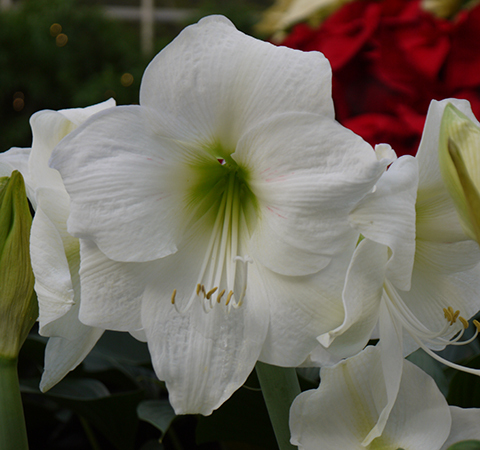 Amaryllis (Hippeastrum) are different from many other bulbs in that they don't require a cold rest--just a mild temperature drop--in order to flower. 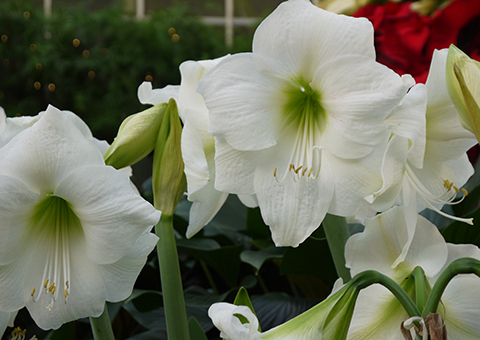 Find out how to grow Amaryllis here. 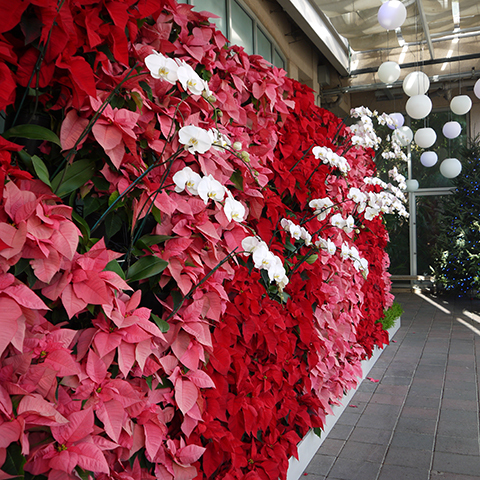 Q: How many plants grow on the Poinsettia Wall in the Conservatory Lobby? The Inside Scoop. 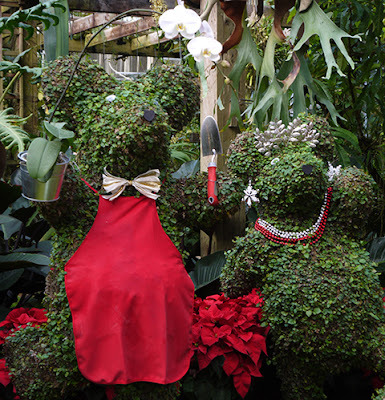 Here are some tips for keeping your Poinsettia looking good throughout the holiday. First, remove your plant from its plastic sleeve immediately upon arriving home. Plastic sleeves are the pits for Poinsettia bracts. Second, grow it warm--no colder than 62º at night and 70-75º during the day. Keep it in bright light, away from drafts and let it dry out a bit between watering. 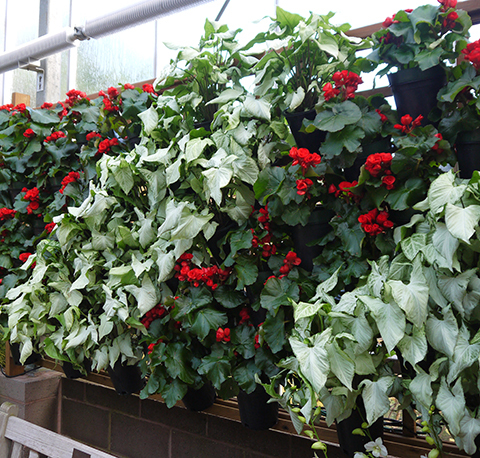 Follow the links to find out more about Poinsettia care and Poinsettia history. 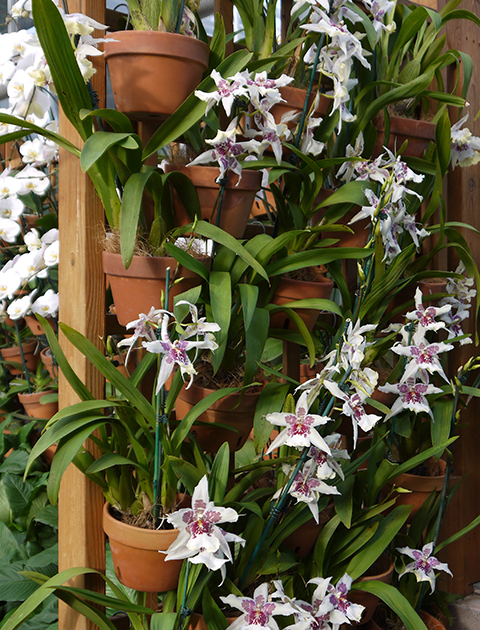 Q: What is the wonderful fragrance in the Orchid Display House? A: Angraecum eberneum subsp. superbum, an orchid native to Madagascar that is fragrant only at night. The entire bed is in flower now and the fragrance is heavenly. The Inside Scoop. The fragrance is produced to attract a night-active pollinator--a hawk moth--that feeds on the nectar located in the flower's long spur. Q: What's up with the Three Bears? The Inside Scoop. Only one visitor asked whether a family of bears might not be more likely to regard a dog as a potential dinner rather than as a pet. Certainly not. Our bears are vegetarians. Q: What's Baby Bear's name? A: He doesn't have one (yet). Please suggest one! Q: Where do Mama & Papa Bear shop for clothes? The Inside Scoop. Not really. Tres Fromme, our Landscape Design & Planning Manager, made an undercover trip to Target to buy bear accessories, but only because he wanted to check out the store's selection of Transformers. 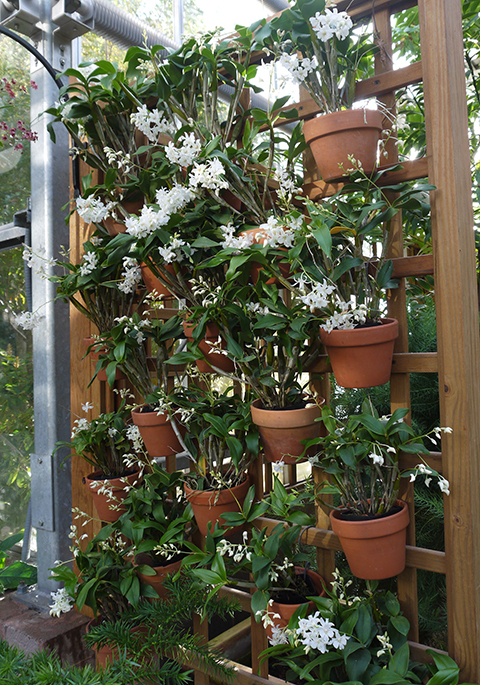 Q: What flower in the Orchid Display House smells like vanilla? 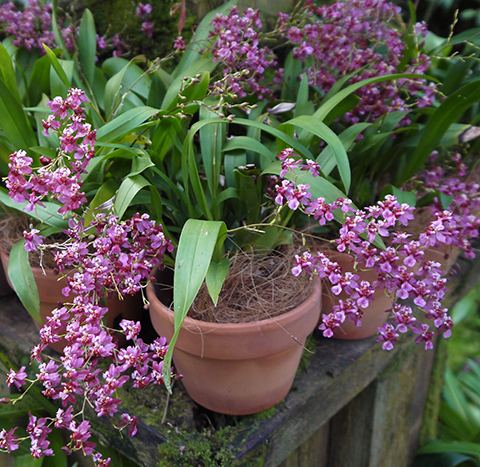 A: Oncidium Twinkle 'Red Fantasy'. The Inside Scoop. The lovely yellow form of Twinkle is flowering above the reflection pond, and also smells like vanilla. 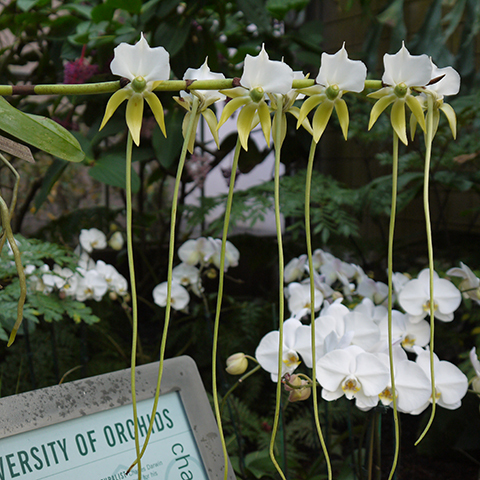 Q: What are the beautiful white orchids in the Orchid Atrium? The Inside Scoop. 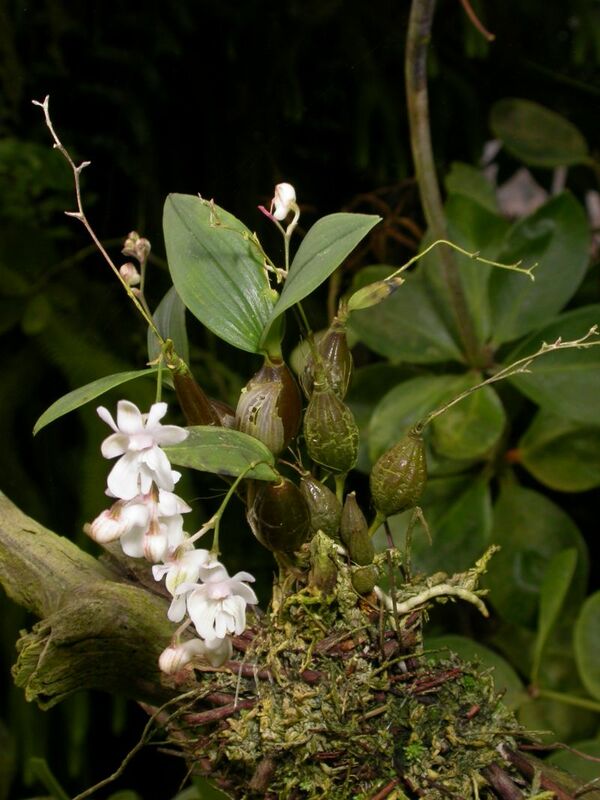 Dendrobium aberrans is an adorable miniature that you can find flowering in the Tropical High Elevation House later this year. 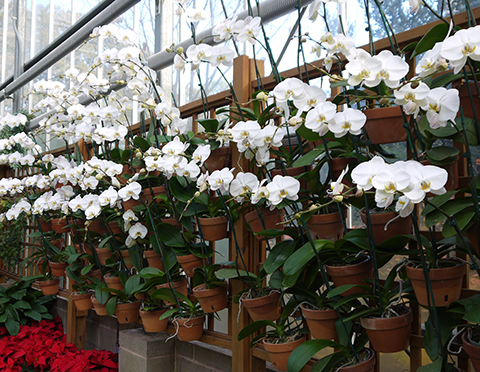 Q: What are the festive plants on the trellis in the Orchid Display House? A: Begonia Veronica & Nephthytis (syn. Syngonium) Holly. The Inside Scoop. Begonia Veronica is a type of Rieger Begonia. 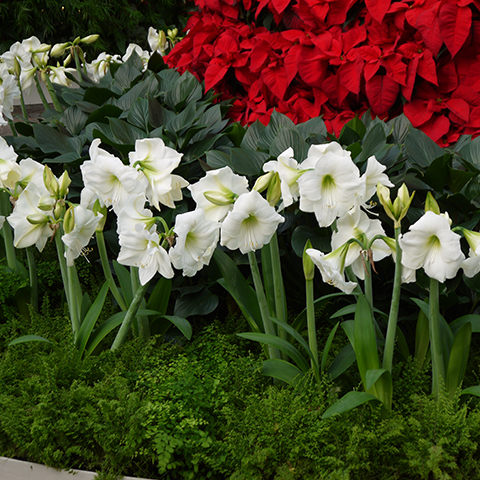 It is a short day plant--meaning that it flowers naturally in winter. Nephthytis is a ridiculously easy houseplant. 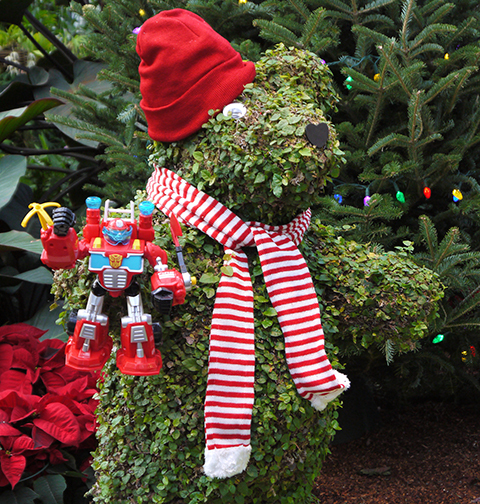 Q: What is the trio of plants under the Poinsettia tree? 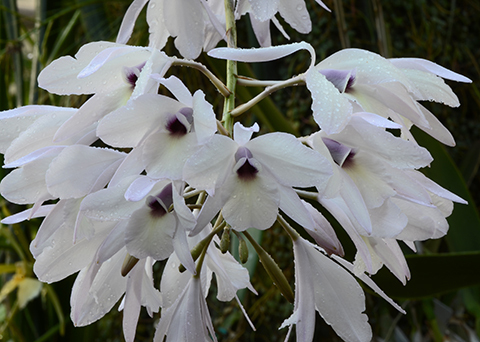 Q: What other wintry white orchids are in flower now? Bring your friends and family and stop by! The Garden is open regular hours during the day. Garden Lights Holiday Nights opens nightly at 5 pm.